Updated Sunday April 7, 2019 by HASB Admin. 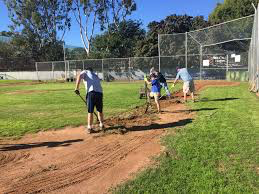 Saturday, April 13, 2019 is our annual field set up and clean up day at Holiday Lane. We plan to be at the field by 9:00am to set up the netting on the batting cages, hang our sponsor signs, rake the fields, blow leaves, clean the snack shack, and do everything else that is needed to get our season ready for success. We need as many volunteers as possible to make the work go quickly. Please consider bringing rakes, wheelbarrows, brooms, or anything else that would be helpful to make this annual task easier.